Even before our friends at the federal level decided to delay implementation of ICD-10, I had been reading quite a bit about the different strategies health systems are planning to employ in support of the transition. With the delay, most vendors are continuing full speed ahead so that they can be sure to be ready for an eventual implementation. Although some advocate waiting for ICD-11, many feel it’s a foregone conclusion that ICD-10 will happen. Most articles I’ve read have been about preparing your practice, ensuring coders are trained, and ensuring software is updated. There hasn’t been much talk out there about how to actually train physicians (who will continue to ultimately be responsible for the diagnosis and coding as they have always been) on the new system. 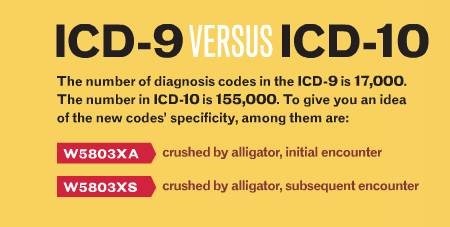 For those of you who not playing along at home, the change from ICD-9 to ICD-10 gives providers approximately 138,000 additional ways to miscode a diagnosis. ICD-9 has a single code for a closed femur fracture. ICD-10 has 36 and it’s difficult to see how physicians or payers will really benefit from that level of granularity. Histories will have to include information which isn’t relevant to most physicians, such as the part of the home in which an accident occurred. When that information isn’t collected at the point of care, staff will either have to call patients to gather the details or risk lower reimbursements from perceived lower acuity when non-specific codes are used. Additionally, the article reminds us that in many practices there is high staff turnover, meaning that staff that are incurring training costs now may be working elsewhere in the future. Overall, the types of medicine that will be most affected by ICD-10 include cardiology, cardiothoracic surgery, emergency medicine, general internal medicine, neurology, obstetrics, oncology/hematology, orthopedics, psychiatry, and vascular surgery. Of the disease processes typically encountered by internists, the ones that are most affected under ICD-10 are cardiovascular disorders, cerebral infarctions, diabetes, gout, musculoskeletal conditions, neoplasms, respiratory disorders, and underdosing. I don’t know about you, but those little “pointers” don’t make me think I can do anything but contemplate how long I have before I can actually retire. I think many of us are pinning our hopes on software and technology vendors – hoping that notes can be parsed and prompts constructed to ensure all necessary information is gathered during the patient encounter. Often, however, the patient doesn’t even know the information required. For example, was the myocardial infarction inferolateral or basal-lateral? Did it involve ST segment elevation? In order to ensure coding accuracy, it seems like there will be much time spent in hunting old records lest we risk being “dinged” for poor coding. I’m sure it was easy for some non-medical proofreader to confuse “subsequent” with “sequelae,” but whenever coding is at play, the devil really IS in the details. Say I was at the Pike Place Fish Market and I was struck in the left shoulder by a mackerel. How would I code that? And would it make a difference whether it was a mackerel or a shark? What if the mackerel wasn’t flying through the air, but was being swung at the time? Does it really matter? E-mail me. One area where I’ve seen little analysis online is what to do with ICD-9 historical data already in EHRs. When a patient comes in for their first post-ICD-10 visit, how is their problem list going to be dealt with? When a practice is trying to report on outcomes for the past five years, how do they deal with the fact that they have four years of ICD-9 data and one year of ICD-10 data? While the levels of ICD-10 granularity can be a bit irksome as well as humorous, in working with physicians, I’ve found that the level of documentation required to support ICD-10 is already ‘in their head’ – they just hate to write it down because it takes time. Certainly, with the structured clinical documentation tools available today via Epic, Cerner, Allscripts, etc. and content engines like Health Language, it will be easier to prompt physicians to document a few basic details needed for ICD-10, e.g. left-side, right-side, upper, lower, the approach taken, whether a device was installed, etc. However, the issue is to get CIOs to recognize that an overhaul needs to occur to their EHR’s structured templates and possibly even order sets. Very few organizations recognize the level of effort required to retool their clinical documentation and order set applications to ensure that your bruised shoulder (right or left?) caused by a flying mackeral (is this identified in the problem list?) which occurred at Seattle’s Pike Place Market (what pier?) is properly documented to allow a coder to interpret your report without having to walk up 3 flights of stairs to the physician’s lounge to ask you ‘did you mean shark?’. So fire up those clinical committees and get started overhauling clin doc templates now! Regardless of ICD-10, improved clinical documentation is already desperately needed (remember RAC?). Ways to assist the docs in documenting is already available in most systems – Wait for ICD-11? Let’s not hold our breath until 2021. Great article and I appreciated the focus on some of the “unintended consequences” in any given physician practice that we can all look forward to soon! NOT! V91.07XD–Burn due to water-skis on fire, initial encounter. I don’t think even Evel Knievel could have pulled that one off. Maybe Lake Erie in 1969…. re:•ICD-9 has a single code for a closed femur fracture. ICD-10 has 36 and it’s difficult to see how physicians or payers will really benefit from that level of granularity. ICD10 and MU are all created to benefit insurance companies, govt payors and medical researchers first and foremost. If anyone thinks thay were created to help providers… keep dreamimng.